The perfect gift to help get your new distributor on the fast track to giving out water and selling machines. Invest a just little bit of your commission, to help them close their first deal Every time they sell a machine you'll get a check. Answers for a Thirsty World DVD - Daniel Dimacale doing his full Thursday night live presentation and water demo. 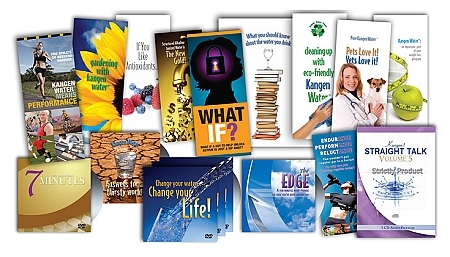 Assorted brochures - 20 assorted trifold brochures. Our amazing new restaurant DVD, "The Secret Sauce"
Confessions of a Skeptical Physician- the top selling book by Dr Tim Mcknight and more! If you want to grow your distributor base fast, invest $79 of your commission and give one of these Distributor Packs with every machine you sell, and you will be on your way to 6A. Help your new distributors get started on the right track. Give them the tools to help make you money! *Based on inventory from time to time we substitute some items in this package, but you will always receive a great assortment designed to help jump start a new distributor!